Plot: Leslie’s in charge of the overnight portion of the diabetes fundraiser, and of course hijinks ensue. That guy is going to propose to Ann, who is going to break up with him because even she cannot remember who he is. April and Andy just need to get married already. And Tom realizes for the very first time that professional athletes are popular. Deep Thoughts: Nope. It’s Friday. Your Related Link For The Day: Perd Hapley does the worm. Who knew that the worm originated in the 1920s? 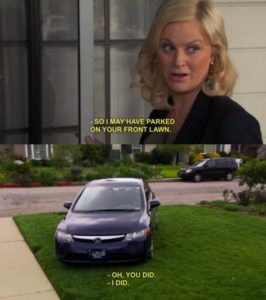 Plot: Leslie wants to impress new boyfriend Justin with a scintillating dinner party and accidentally ends up abusing her position by using all the Parks continuing ed teachers. Deep Thoughts: I’ve actually thought after the last couple of episodes, or at least after writing about them, “Why am I so in love with this show again?” But this episode is back on track. I wonder if the lack of subplots — or, more accurately, the way the substories fit into the main plot (the party) without distracting from it — makes it better writing? 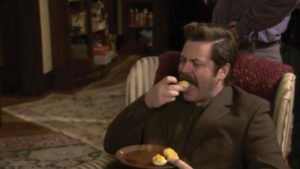 There’s no gratuitous misogyny, lots of relationship-building, great one-liners, true-to-character writing, and Ron eats a plateload of deviled eggs. Thumbs up. Okay, before we even get to anything, can we just take a minute about Chris Pratt and Anna Faris? I’m very sorry they’re going through whatever they’re going through. That said, can we start some sort of petition to get Chris Pratt to marry Aubrey Plaza? I would ship that so hard. Plot: Leslie decides she’s ready to date again, and is interested in Ann’s backup guy. That guy Ann’s dating isn’t happy about this. Ron has to do actual work and isn’t happy about that. The writers apparently went on vacation and left other writers behind to handle Jerry’s character for a week. Plot: Tom’s getting a divorce and Leslie wants to cheer him up. Oh, and there’s a totally stupid subplot involving Andy and that nameless guy Ann’s dating who have a pool competition to see who owns Ann. Mark realizes it’s ridiculous, of course, but I don’t care because he is a zero. Andy again seems to have no idea that he’s being scary, because as we all know, stalking is love, and it’s gross, and I can’t wait for him to move on. Plot: The whole crew goes hunting, and someone shoots Ron in the head. More importantly, they shoot out one of Donna’s car’s windows. Left behind at work, April and Andy become friends. Also, women can’t shoot guns good because they get tunnel vision. 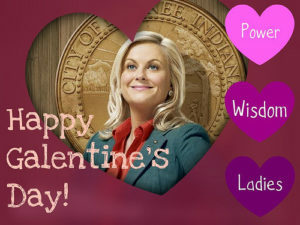 Plot: Pawnee needs a new mural and Leslie is determined that her department will win the suggestion contest. Ron likes Andy’s shoe-shining a little too much. 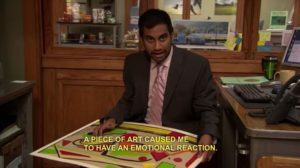 Tom discovers art. 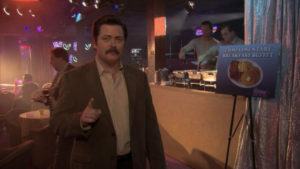 For the first time in this second watching of the show, I have that “Oh wow, I married Ron Swanson” feeling. Plot: Leslie finds out the Library Department wants her newly filled lot, the woman behind this nefarious plot wants Ron, and Ron wants a naked brunette and a waffle. 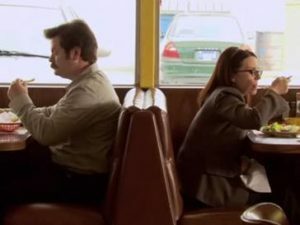 Deep Thoughts: There is some loss in knowing that Nick Offerman and Megan Mullally are real-life married, because this isn’t just a truly delightful onscreen chemistry between two professional actors. But it is nonetheless truly delightful to watch. 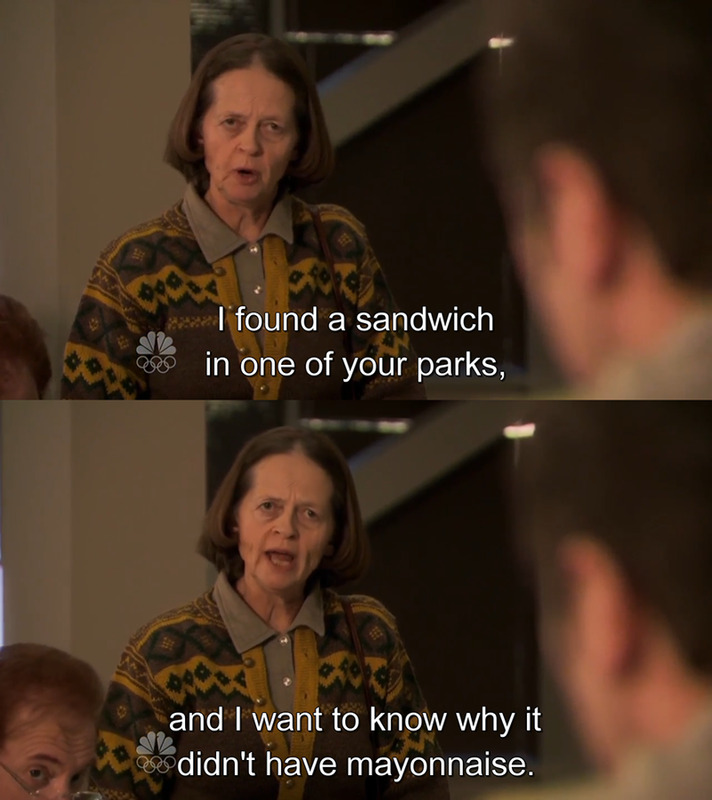 Tammy is a fabulously evil character and Ron-out-of-control is a beautiful thing. Your Related Link For The Day: Tammy says “We government gals have to watch each other’s backs, right?” Tammy is evil, but her point stands. We have to watch each other’s backs… and we need to be in government. Go read about Emily’s List and then think about running for office (if you’re a lady), or helping an awesome woman you know do so. Plot: It’s Halloween! 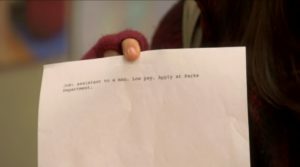 Ann throws a terrible party, which Leslie misses entirely because of her obsession with a local teen and his vandalism. This is one sharp teenager, too. You can tell he’s going to grow up to be Julian Assange or something and think he’s very badass. This is also our first encounter with the delightful Bert Macklin of the FBI. Apparently the FBI also loved Bert Macklin. 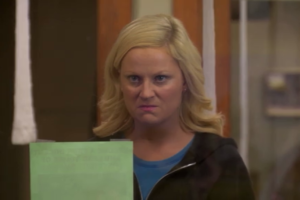 Deep Thoughts: I wish there were a little more backstory about how Leslie pinpointed Greg as her vandal, and the things he’s done to “screw with her ’cause she gets all riled up, and her face gets all scrunched up like this.” Or that he ever showed up again. Maybe as an intern? That would have been excellent, and might have helped divert him from the path of a criminal mastermind.